They say forest bathing is great for your health and food for the soul. Taking in the forest through our senses can relax us in an instant. 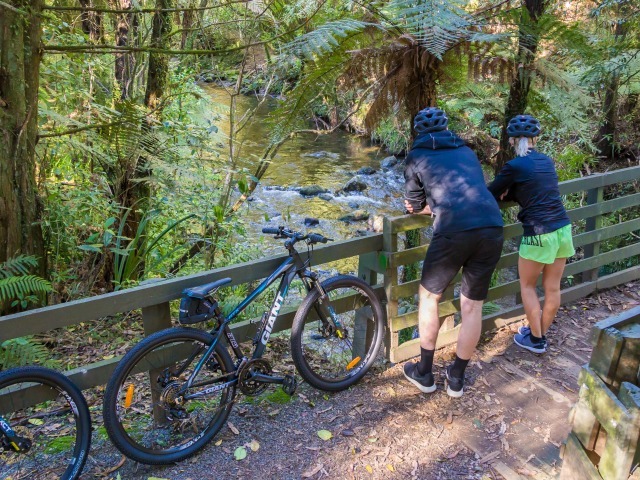 You will be feeling like a new person then, after experiencing the lush greenery, native bush, soothing bird sounds, and running river on your visit to King Edward Park . Named after King Edward VII in 1902, the park was marked for the King’s coronation. The historic Malone’s Gates are the main entrance to King Edward Park , on the corner of Fenton and Portia Streets, right in Stratford. They were built in 1923 as a tribute to Colonel William Malone, a local war hero who was killed at the battle of Chunuk Bair, Gallipoli, in 1915. Near the gates, a seedling from Gallipoli’s Lone Pine Ridge was planted in 1968 and now stands as a commemorative lone pine tree. The park encompasses the TSB Swimming Pool Complex, a children’s playground, known for its fun elephant climbing frame, playing fields, and netball courts. King Edward Park offers a number of bush walks along the river, simply choose a walk to fit your time limit and fitness level. The Three Bridges Trail is a 20 minute loop which is pram friendly and takes you over the swing bridge which was built in 1902. From the bridges you’ll take in the calming sights and sounds of the Patea river which snakes its way along the park. The McCullough Rhododendron Dell is a spectacular area of the park, especially in Spring as the colours of the Rhododendron hybrids, azaleas, and hydrangeas bloom and bring King Edward Park to life. Stop and have a picnic at one of the picnic tables scattered along the lawn, or bring your own picnic blanket and find a spot by the pond. Just be careful the friendly local ducks and swans don’t try to share your picnic. King Edward Park is full of history, and relaxing paths to stroll. Take your dog for a walk or the children for a play in the playground. This park is a little gem in the heart of Stratford. Absolutely. King Edward Park is right in Stratford. If you are driving from further out of town, there is plenty of parking at the Malone’s Gates entrance. No, choose a walk to suit you. The Clemow walk is 15 minutes, or a walk from the entrance to the pond is a short, easy walk. Dogs can be off lead at King Edward Park. Of course, for the usual areas such as the children’s playground and public footpaths, dogs will need to be back on their leads.